URI Watershed Watch volunteer samples water at Mellville Pond. Photo courtesy of Watershed Watch. Rhode Island monitors waters for algae and cyanobacteria in order to institute appropriate precautions when a bloom occurs. 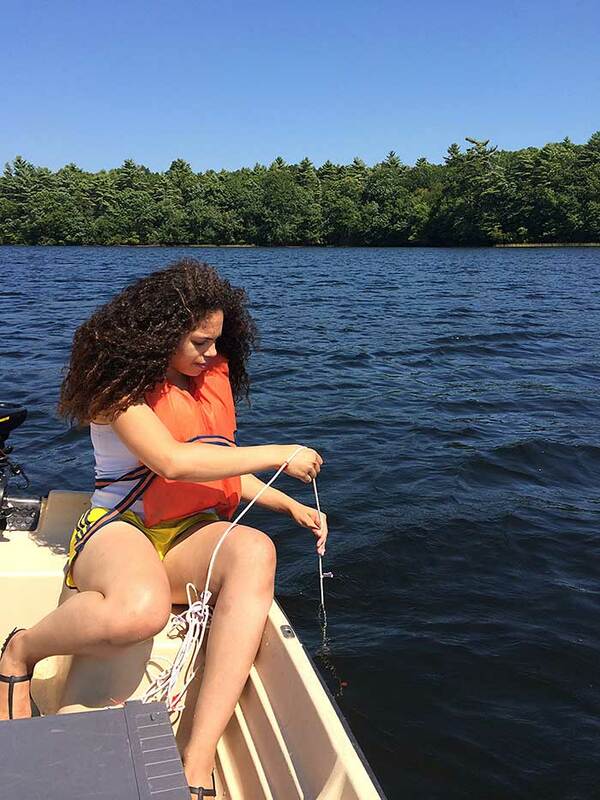 In freshwaters, growing awareness of the issue of cyanobacteria blooms prompted the RI Departments of Environmental Management (RIDEM) and Health (RIDOH) to institute a limited monitoring program to both screen for and confirm the presence of cyanobacteria. In 2016, the limited effort was continued in the form of a response program based on staff observations and reports from the public. RIDEM investigates reports of blooms by making visual observations and collecting water samples. The samples are then analyzed for presence and identification of cyanobacteria species, assessment of which cyanobacteria is the dominant species, and qualitative estimate of cell densities. Samples may be sent to the RIDOH for confirmation of toxin concentrations. For confirmed cyanobacteria blooms in freshwater, RIDOH, in collaboration with RIDEM, issues public health advisories based on three criteria for cyanobacteria: visible scum is present on the water, total cell counts exceed 70,000 per milliliter, and microcystin toxin—the toxins released by cyanobacteria—exceeds four parts per billion. Once an advisory is issued, the water body may be monitored on a bi-weekly basis. If two successive sampling rounds indicate that criteria are no longer exceeded, then the advisory is lifted. Rhode Island monitors coastal waters and shellfish beds for algae to institute appropriate precautions when a bloom occurs. Routine monitoring is performed from April to November in shellfish growing areas and open water, either six or twelve times per year depending on the location. Phytoplankton cell counts are performed on water samples from the monitored areas. Approximately 150 samples are analyzed each year. Special attention is paid to the phytoplankton species that produce toxins that are harmful to humans (Alexandrium spp, Dinophysis spp, Pseudonitzschia spp.). When these data show high cell counts for phytoplankton types that produce human toxins, further monitoring is triggered to detect the presence of the specific toxin associated with the species that was found. The closure is lifted when cell counts decrease and toxins are no longer detected in sampled shellfish. 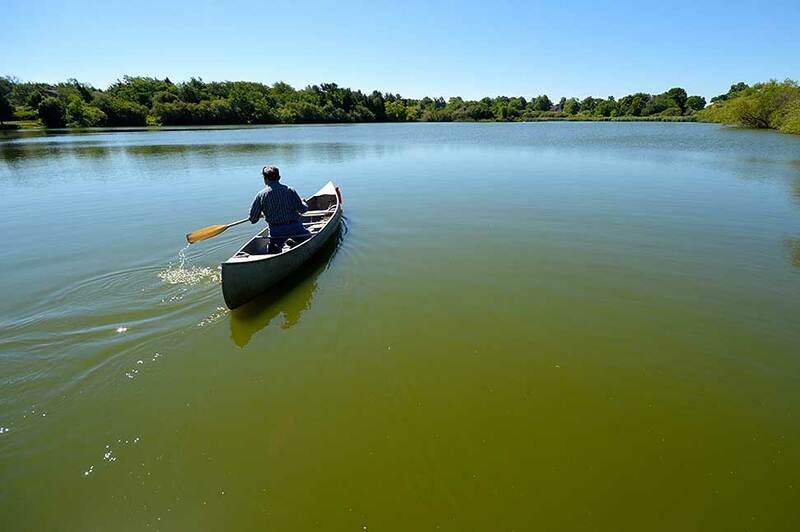 URI Watershed Watch volunteer Thurston Gray rows onto Upper Melville Pond during a 2015 cyanobacteria bloom. Photo courtesy of T. Gray.